For a simply life to succeed long-term, it’s important to remember one very important thing: Everything doesn’t have to be done the simplest way every time. 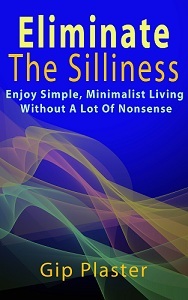 Consider this a suggestion that you simplify your approach to simplicity. When you simplify simplicity down to it’s most basic form, you really shouldn’t be leaving the house. The simplest thing to do is to stay home. Driving consumes natural resources, and walking sometimes puts strain on your body. The simplest thing to do is sit quietly. I suppose you could read a book, but are your eyeglasses really part of the simplest version of your life? You don’t wear complicated-to-maintain contacts do you? And who can be bothered to go buy a book? You know, I just thought of something that’s great for me, if not for you: My vision is near-perfect without glasses, so I suppose I’m one of the lucky ones. I can look at things without violating my desire to live a simple life. Of course, none of us want a life that’s so completely simple we don’t even listen to birds singing without guilt. Guilt, you see, is the by-product of focusing so much on being true to our lifestyle that we don’t live our lives. Here’s a very mundane and boring example, but it’s on my mind today: A few weeks ago on a Tuesday, David and I went to fast food restaurant 13.5 miles from our home at 8 p.m. to have free cinnamon rolls for which we each had coupons. We made a special trip. It was simply magnificent trip. With a cold north wind blowing, the sky was clear, and the view as we came down out of the hills around our home was amazing. The cinnamon rolls themselves were wonderful, and we stopped by a grocery store and bought a couple of spices I had been wanting that I couldn’t find at my usual places — on sale for less than half price. It wasn’t a very simple idea, though, and it would have been more efficient to stay home. The excursion took almost a gallon of gas, took time away from writing assignments I was working on and wasn’t necessary since we planned to be out the next day anyway. But it was a simple, deliberate pleasure, carefully calculated to bring some joy into our evening. Choosing to live a simple life at the expense of joy is foolish. Choosing to live simply and make deliberate choices about when to add in unnecessary but joyful complexities is amazing. When did you last do something that you knew in advance wasn’t really the simple choice but was certainly the right choice? I honestly can’t imagine having kids, Jo. I’m glad I’m not wired up for them. It seems like a completely foreign idea to me! Having pets is not simple. I have a dog and cat. The cat uses clay litter that is strip mined. And the litter and poo cannot be composted so it fills up landfills in a non-biodegradable bag on a weekly basis. The dog has to be walked 3 times a day. Good exercise for the both of us, but it doesn’t simplify my life. His poo gets picked up in a biodegradable bag that won’t degrade in my landfill because it doesn’t get any oxygen. They require shots, flea medicine, licenses, food, etc. which costs money I could be using to save up an emergency fund. All that being said, I’d be lost without my pets. They bring me much happiness on a daily basis. You’re right. There’s nothing simple about pets, but mine are very important to me, too. We have four cats, and they use clay litter that goes into the trash, too. They won’t consider natural litter, which is too expensive anyway. And I don’t blame them. It doesn’t seem very natural or functional for the purpose! I’m glad you’re here, Kat. I think simplicity for simplicity’s sake might be counterproductive but if it smooths the way for the enjoyment of deliberately planned activities for joy and pleasure then it’s all worthwhile. I can give up a lot if I feel I need to in order to have something I want or go somewhere I want to go. That’s exactly it, Lorie — trading useless items and experiences for ones that are meaningful. I suppose I do this every time I catch a bus,(esp on Sundays when i catch 2 buses to the gym) I have chosen to live a life without a car, its not always easy, or simple but it is right for me. How we live our lives, the choices we make, etc from my view point should be governed by our personal values, joy should definitely be up there, whats the point in it all unless we enjoy our lives.? I does make sense, Alex, and thanks for joining the conversation here once again. Gip, Thank you for being willing to say more than most. To pronounce freedom to the minimalist faithful who too often measure everything in life like a well calculated recipe. Our lives as you so aptly describe are meant to be savored,to be lived and enjoyed. Yes,of course, use a little common sense, but when it is right to experience time with those we love, doing something that we both enjoy, whose to say that isn’t time and money well spent. Great post! For what it is worth…share your voice, spread your vision. Thanks, Jeff, for joining the conversation. I’m glad to have both of you with me on the journey.